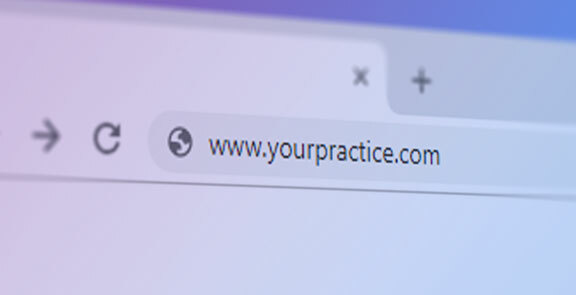 A good domain name increases public name recognition for your practice, allowing your patients to easily find your practice on the Internet. Friends and existing patients will be more likely to pass your website’s name on to others if it is easy to remember. A well-chosen domain name imparts a professional and lasting impression to your patients and website visitors. It helps brand your practice and allows you to have a professional email address. The email address janedoe@yourpractice.com appears much more professional, established and permanent than janedoe@hotmail.com. Why advertise a public e-mail providers name and business, when you can advertise your own practice? Keep it short and to the point – Although you can register lengthy domain names, keep in mind your patients need to be able to remember and easily type your website’s address. Register the shortest name possible that will still allow your patients to associate it with your practice. For example, if your practice name is River Walk Massage Therapy and Wellness Clinic, a domain name such as www.riverwalkwellness.com rolls off the tongue (and keyboard) more easily than www.riverwalkmassagetherapyandwellness.com. Avoid hyphenated domain names – Hyphens in domain names are often forgotten by users wanting to get to your website. You could also inadvertently send your patients to one of your competitors. For example if your website address is www.riverwalk-chiropractic.com and your competitor down the road has www.riverwalkchiropractic.com, your competitor could benefit from your marketing efforts. Hyphenated names are also harder to remember. If a hyphen is used in your business name already, that doesn’t mean you have to use it in the web address (domain name). Avoid names that are close to your competitor’s – For example, if your competitor down the road is using www.riverwalkphysiotherapy.com, it would not a good idea for you to use www.riverwalkphysiotherapy.ca. This could also result in your marketing efforts driving business to the wrong website owner.